Seeing is Believing Vision Board Party 2018! Phylicia Rashad once said "Any time women come together with a collective intention, it's a powerful thing". Her words continue to reign as truth as I think about my experience hosting the "Seeing is Believing" Vision Board Party at Jolie Studios. This having been my 3rd year hosting a vision board event, it taught me that when God tells you "Yes", no one can say no. 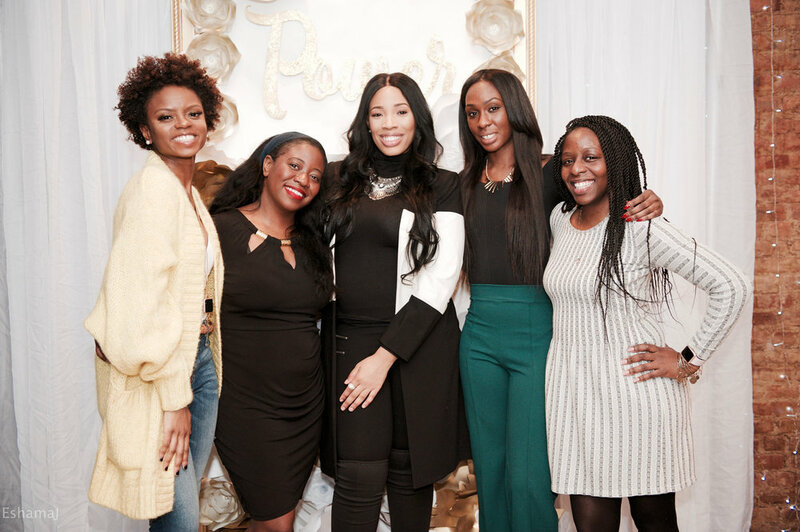 In less than a month, the "Seeing is Believing" Vision Board Party came to life with the help of Nichole Durant of Luxury Hair Closet, Diedre Duke and Jolaine Duke-Collins, owners of Jolie Studios. Jolie Studios is a brand new event space located at the cusp of Flatbush and Lefferts Gardens available to host a variety of events such as baby showers, private dinner parties, business seminars, and of course - vision board parties. Many people question why I dont have videographers to document these conversations. The reason for this is boils down to one word: intimacy. During our conversation we tapped into our fears, open wounds and insecurities and pushed past them to become better versions of ourselves. We shared who we are and where we've been, sometimes without even saying a word. There are some moments that shouldnt be relived. You just had to be there. Although there isnt much footage, our amazing house photographer Eshama John blessed us with amazing photos and I will share with you a bit of what we shared during our conversation. If you attended last year's Vision Board Party you remember our emphasis on affirmations with Radio Host, Tracy G. Affirmations are self declarations that become truth with faith and action. Affirmations above all are action words and are catalysts of accountability. I shared a few of my favorite affrimations with our guests and they're available for download for your iPhone lockscreen here. Often times we are told we are to give without expecting to recieve. This is true in most cases but when it comes to our everyday lives, we must know how to do both. Your heart must be open to receiving love in order to give love just the same. Many people don't know how to receive love and they remain unhappy. In order to practice giving and receiving love, I had our guests give compliments to one another and respond with a sincere "thank you". This simple exercise allows us to see ourselves the way others see us an well as verbalizing what we love about other people. This is the simplest way to give and recieive love from others. The more you give love, the more love will return to you. Diedre and Jolaine are both mothers with 9-5's and still manage to run a flourishing business. I wondered how they were able to juggle the many responsibilities they carry. They could attribute it to none other than the support they receive from those who surrounded them. It gave us the responsibility of supporting those we see around us pushing to be greater. (Support is another way of giving love!) Lesheaya could also attest her success to the support of her mother. She mentioned that without her mom to help her transport fabrics, answer eamils and engage in day to day activities she wouldnt be where she is today. Jolaine shared a story about her depression and how she delivered herself with one tube of red lipstick. She wrote "I AM ENOUGH" on every mirror in her home. Everytime she saw her own reflection, she was reminded that she is enough and eventually began to believe it. Believing in herself allowed her to build a dream event space that all started with her vision board. Lesheaya Diaz, CEO and designer behind the Haus of Shea and Shades of Shea clothing brands explained what it's like to be the motivating force behind her clients who tend to feel "less than." She makess an effort to have her clients own their beauty and believe they are beautiful. Deidre made clear that its vital that we own who we are. With whatever we do, we must have confidence that we are deserving of the titles we've earned. We must believe in the greatness we speak over ourselves before we try to convince the world. It begins with you! Vision boards can come to life if you really want it to, but they're not effective because you pasted a few things together. They're effective because you believe they are yours and you put in the work to make it happen! Your vision board should remind you that there is always work to be done. With a little effort, much faith, and a great support system anything is possible. I couldn't have hosted this amazing event without Diedre, Jolaine, Nichole and Lesheaya. I thank them for their powerful influence on our guests and I cant wait to see how their businesses will continue to impact our community in a positive way. Thank you so much for believing in me! Until next time!